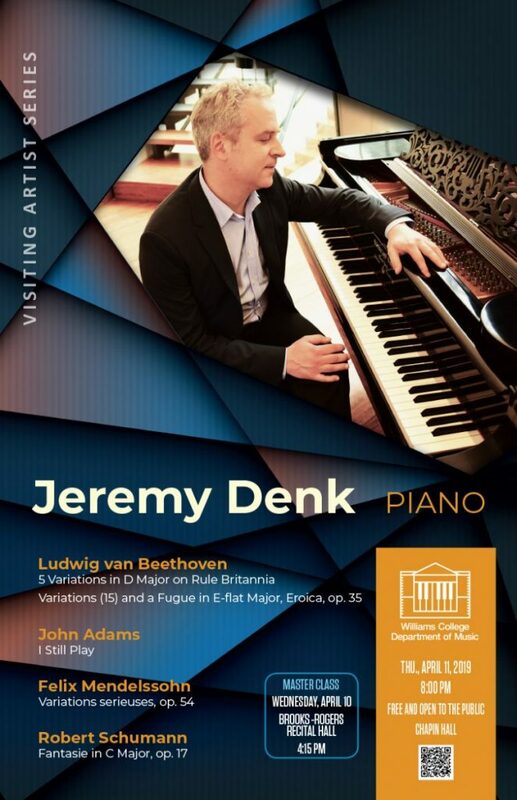 Acclaimed pianist Jeremy Denk offers a program of contrasts which includes Ludwig van Beethoven’s 5 Variations in D Major on Rule Britannia, John Adams’ I Still Play, and Variations serieuses, op. 54 by Mendelssohn. He finishes the first half with Variations (15) and a Fugue in E-flat Major, Eroica, op. 35 by Beethoven. After an intermission, Mr. Denk finishes in grand style with Robert Schumann’s Fantasie in C Major, op. 17. Jeremy Denk is one of America’s foremost pianists. Winner of a MacArthur “Genius” Fellowship, and the Avery Fisher Prize, Denk was recently elected to the American Academy of Arts and Sciences. Denk returns frequently to Carnegie Hall and has recently performed with the Chicago Symphony, New York Philharmonic, Los Angeles Philharmonic, San Francisco Symphony, and Cleveland Orchestra, as well as on tour with Academy St. Martin in the Fields, and at the Royal Albert Hall this Summer performing Bartok 2 in his return to the BBC Proms. In 17-18, Denk reunites with Michael Tilson Thomas and the San Francisco Symphony to perform Bartok 2. He will also return to Carnegie Hall, both to perform Beethoven 5 with Orchestra St. Luke’s, and alongside Joshua Bell, one of his long- time musical partners. Returning in subscription to the Seattle Symphony, Denk will also embark on a tour with the orchestra performing Beethoven 5, and he continues as Artistic Partner of the St. Paul Chamber Orchestra with multiple performances throughout the season, including the premiere of a new piano concerto written for him by Hannah Lash. He also appears in recital throughout the US, including performances in New York, Chicago, Philadelphia, Boston, Houston, Seattle, Los Angeles, Baltimore and Princeton. His collaborations in 17-18 included a US tour of the complete Ives Violin Sonatas with Stefan Jackiw in a special project in which Denk presented the sonatas with a vocal ensemble performing hymns embedded in the compositions. A recording of the Sonatas with Stefan Jackiw is forthcoming from Nonesuch Records. Abroad, Jeremy Denk will be presented by the Barbican in multiple performances as artist-in-residence at Milton Hall. 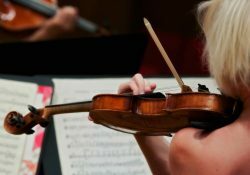 He will also return to play-direct the Britten Sinfonia in London, and on tour in the UK. In Asia, Denk will make his debut in recital in Hong Kong, Seoul, and Singapore. Future projects include re-uniting with Academy St. Martin in the Fields for a tour of the US, and a trio tour with Joshua Bell and Steven Isserlis. In 16-17, Denk toured extensively in recital including performances at the Wigmore Hall and Lincoln Center’s White Light Festival in a special program that included a journey through seven centuries of Western music. He also returned to the National Symphony led by Sir Mark Elder, and performed with the St. Louis, Vancouver, and Milwaukee Symphonies, and the St. Paul Chamber Orchestra, among others. Denk also recently made his debut at the Amsterdam Concertgebouw, the Philharmonie in Cologne, and Klavier-Festival Ruhr. Denk’s upcoming releases from Nonesuch Records include The Classical Style, with music by Haydn, Mozart, and Beethoven. He also joins his long-time musical partners, Joshua Bell and Steven Isserlis in a recording of Brahms’ Trio in B-major. His previous disc of the Goldberg Variations reached number one on Billboard’s Classical Chart. 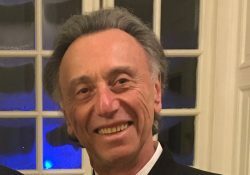 In 2014 Denk served as Music Director of the Ojai Music Festival, for which, besides performing and curating, he wrote the libretto for a comic opera. The opera was later presented by Carnegie Hall, Cal Performances, and the Aspen Festival. Denk is known for his original and insightful writing on music, which Alex Ross praises for its “arresting sensitivity and wit.” The pianist’s writing has appeared in the New Yorker, the New Republic, The Guardian, and on the front page of the New York Times Book Review. One of his New Yorker contributions, “Every Good Boy Does Fine,” forms the basis of a book for future publication by Random House in the US, and Macmillan in the UK. Recounting his experiences of touring, performing, and practicing, his blog, Think Denk, was recently selected for inclusion in the Library of Congress web archives. In 2012, Denk made his Nonesuch debut with a pairing of masterpieces old and new: Beethoven’s final Piano Sonata, Op. 111, and Ligeti’s Études. The album was named one of the best of 2012 by the New Yorker, NPR, and the Washington Post, and Denk’s account of the Beethoven sonata was selected by BBC Radio 3’s Building a Library as the best available version recorded on modern piano. Denk has a long-standing attachment to the music of American visionary Charles Ives, and his recording of Ives’s two piano sonatas featured in many “best of the year” lists. 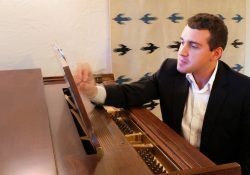 Jeremy Denk is presented by the Williams College Department of Music with the generous support of the W. Ford Schumann ’50 Performing Arts Endowment.